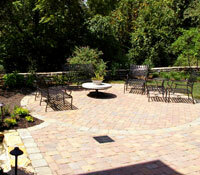 At Cincinnati Horticulture Group, we design and build outdoor living spaces. These projects can incorporate, but are not limited to hardscape, softscape, low voltage lighting and built-in fire pits or fireplaces. 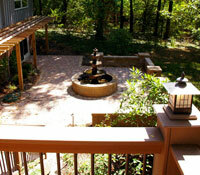 Outdoor rooms are extensions of your home. 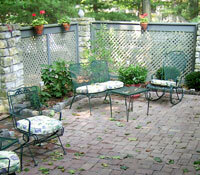 They make wonderful areas for entertaining, cooking and eating, or just enjoying a quiet evening outside. We take great pride in providing precise and well thought out site plans for your project. With any plan, we consider drainage, water routing, potential maintenance issues, climate and exposure to the elements. Our installers work from a scale drawing that we create in-house. Often times the plan designer is present on the job site to oversee operations and monitor quality control. We do not believe in taking short cuts and emphasize the importance of completing the project correctly.